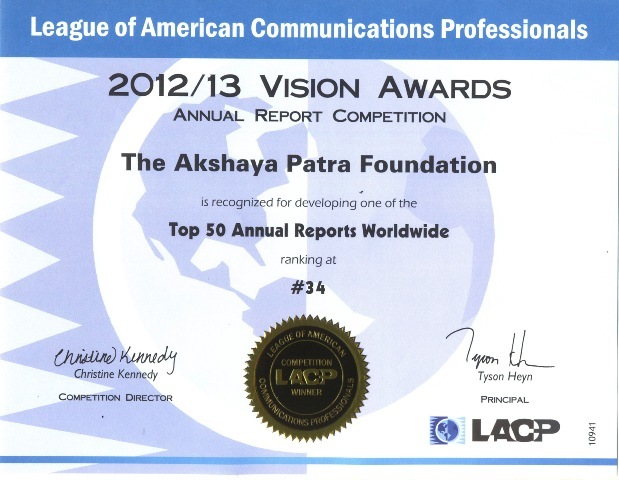 The League of American Communications Professionals (LACP), in their Annual Report Competition, the 2012/13 Vision Awards, have awarded The Akshaya Patra Foundation with the Gold Award for excellence within its industry in the development of the organisation’s annual report within the last fiscal year. LACP was established in 2001 to create a forum within the public relations industry that allows discussion on best-in-class practices within the industry and also recognizes those who demonstrate exceptional communications capabilities. As part of this programme, LACP hosts quarterly competitions which routinely include hundreds of entries from some of the most recognised organisations across the world. The award recognizes The Akshaya Patra Foundation for developing one of the top 50 annual reports worldwide, ranking Akshaya Patra at number 34. Out of more than 6,000 entries, representing over two dozen countries and 800 entities, Akshaya Patra’s Annual Report sets itself apart in its excellence. “This year’s annual report by The Akshaya Patra Foundation (Made by the children, enabled by you) proves to be remarkable in light of tremendous competition,” said Christine Kennedy, LACP Managing Director. In judging the annual report, the work was said to be ‘outstanding’ earning Akshaya Patra a total of 98 from a maximum of 100 points. From the overall appearance to the cover of the publication, letter to the shareholders, report narrative and robust financials, the judges found Akshaya Patra’s annual report far above standard. “The level of creativity exhibited in the report judged for The Akshaya Patra Foundation is outstanding, which is supported by excellent clarity in communicating this year’s key messages. It should also be noted that accessibility to key information sought by readers is outstanding,” continues Kennedy. Even among the judges, Akshaya Patra’s Annual Report received special attention with “Excellent messaging to the target audience, noteworthy among the entries” and “A very engaging entry. Job well done!” being some of the appreciation received. The Akshaya Patra Foundation is honoured to be chosen for this award, and is thrilled to have the hard work and dedication of its team recognized in an international arena. Looking ahead, we look forward to achieving more with every coming year and surpassing even our own expectations.